Columbia, South Carolina. January 27th, 2011. 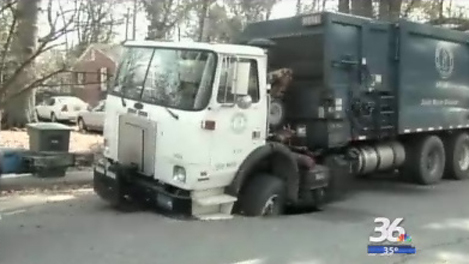 Columbia, SC (WLTX) – A City of Columbia truck fell into a small sinkhole in one of the neighborhoods off Rosewood Drive. The incident took place Thursday in the area near Elm Avenue and Prentice Avenue. 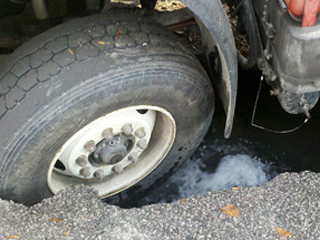 At the scene, water could be seen flowing underneath the tire which fell into the hole, but it’s unclear if a pipe was actually damaged. 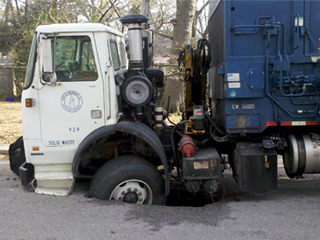 This entry was posted in Pictures, Vehicle v Sinkhole and tagged garbage truck, sinkhole, South Carolina. Bookmark the permalink.